The new Jeti SBEC is a switching BEC designed to regulate the voltage from your 6-42V power source (2-10S Li-Poly or 2-12S LiFe packs) and provide a selectable output voltage of 5 to 8 volts at up to 12 amps. 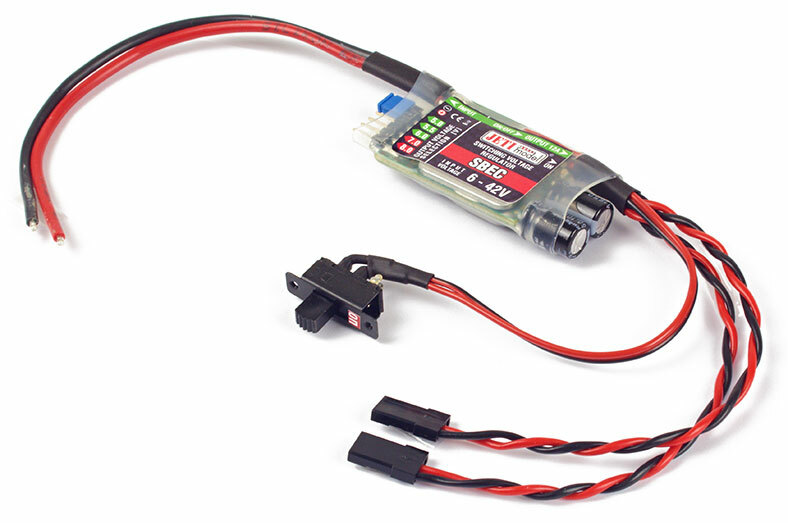 With high output voltages available the Jeti SBEC switching regulator is ready for your high-voltage servos and will satisfy the requirements of most modelers. The Jeti SBEC voltage regulator is very simple to use allowing the output voltage to be selected by using the included jumper plug, which can be moved between the pins to instruct the SBEC to output the corresponding voltage. The Jeti SBEC is fitted with two JR plugs on the output side and an arming switch. The input side consists of single positive/negative wires for connection to your battery.